Explores with young teens how cocaine changes the way nerve cells communicate in the brain and the negative effects the drug can have on the body. NIDA. "Cocaine." National Institute on Drug Abuse, 1 Jan. 2009, https://www.drugabuse.gov/publications/mind-over-matter/cocaine. NIDA. Cocaine. National Institute on Drug Abuse website. https://www.drugabuse.gov/publications/mind-over-matter/cocaine. January 1, 2009. 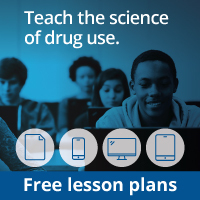 Invites young teens to take a scientific journey to learn about the brain’s complex responses to specific drugs, including cocaine, hallucinogens, inhalants, marijuana, nicotine, opiates, prescription drugs, and steroids.